In time, all fighters will have qualities that deceive, evade, confuse, lock-on to a target and kill it – without being seen, heard or detected.There is no place to hide and when the fourth generation know they are under attack – they are already dead. Fighter forces around the world seek the best that technology can provide – pilots need to put themselves outside their cockpit, peering far beyond visual range, leaving the aircraft to keep them out of harm’s way while they manage the mission. Beyond the horizon where enemies lurk in dark skies and dangerous places, weaponised platforms seek them out and neutralise their effect. Net-centric warfare and sensor fusion takes the fight into the very heart of the weapons systems computer, apportioning missiles to discriminated targets, tracking up to 100 hostiles and downing many beyond visual range, before they see their predator, a prey unprotected and vulnerable. Future fighters will connect to satellites in space for information about enemy air assets, control swarms of unmanned combat air vehicles and plan the end-game for an air battle that has yet to begin And when the sixth generation arrives it will be like nothing that has yet been seen – combining trans-atmospheric air vehicles moving down from the edge of space faster than a ballistic missile, engaging at hypersonic speeds and killing with impunity. 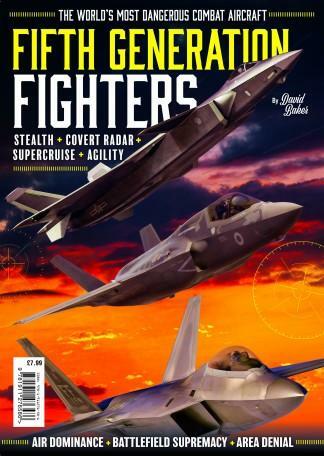 Be the first person to tell us what you think about Fifth Generation Fighters and you'll save £2.50 on your next purchase!